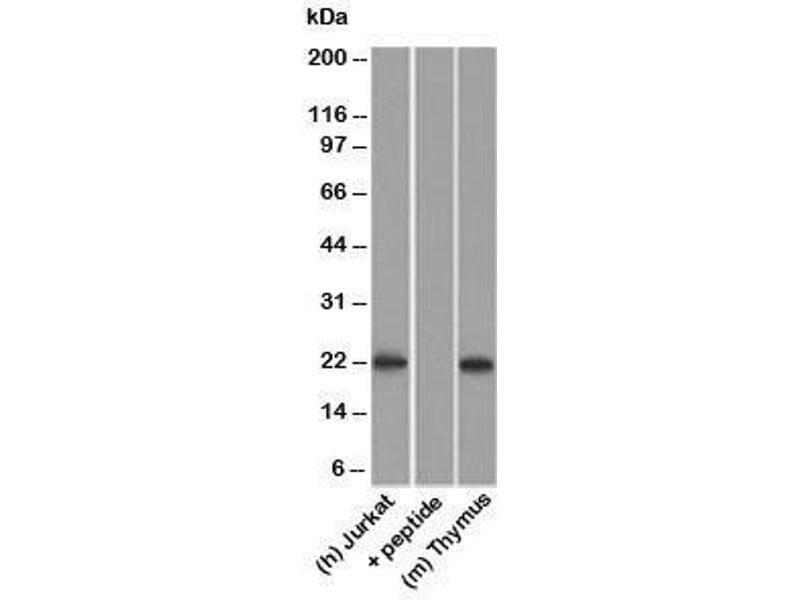 Western blot testing of human Jurkat lysate in the absence and presence of immunizing peptide, and mouse thymus lysate probed with CD3e antibody. Western blot testing of Jurkat lysate with CD3e antibody. Characteristics This antibody recognizes the epsilon-chain of CD3 (CD3e), which consists of five different polypeptide chains (designated as gamma, delta, epsilon, zeta, and eta) with MW ranging from 16-28 kDa. The CD3 complex is closely associated at the lymphocyte cell surface with the Tcell antigen receptor (TCR). Reportedly, CD3 complex is involved in signal transduction to the Tcell interior following antigen recognition. The CD3 antigen is first detectable in early thymocytes and probably represents one of the earliest signs of commitment to the Tcell lineage. In cortical thymocytes, CD3 is predominantly intra-cytoplasmic. However, in medullary thymocytes, it appears on the Tcell surface. CD3 antigen is a highly specific marker for Tcells, and is present in majority of Tcell neoplasms. Immunogen Amino acids ERPPPVPNPDYEP (156-168) were used as the immunogen for this CD3e antibody. 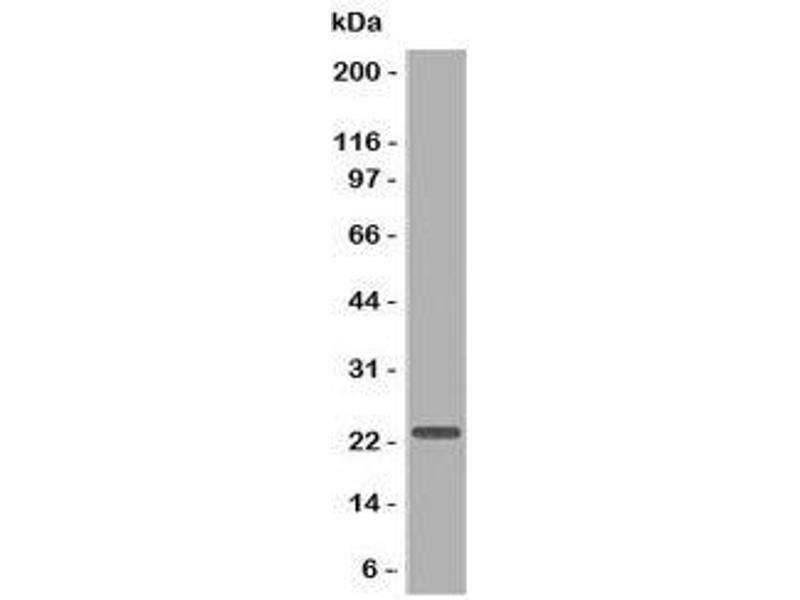 Background This antibody recognizes the epsilon-chain of CD3 (CD3e), which consists of five different polypeptide chains (designated as gamma, delta, epsilon, zeta, and eta) with MW ranging from 16-28  kDa. The CD3 complex is closely associated at the lymphocyte cell surface with the Tcell antigen receptor (TCR). Reportedly, CD3 complex is involved in signal transduction to the Tcell interior following antigen recognition. The CD3 antigen is first detectable in early thymocytes and probably represents one of the earliest signs of commitment to the Tcell lineage. In cortical thymocytes, CD3 is predominantly intra-cytoplasmic. However, in medullary thymocytes, it appears on the Tcell surface. CD3 antigen is a highly specific marker for Tcells, and is present in majority of Tcell neoplasms. Storage Comment Store the CD3e antibody at 2-8°C (with azide) or aliquot and store at -20°C or colder (without azide).